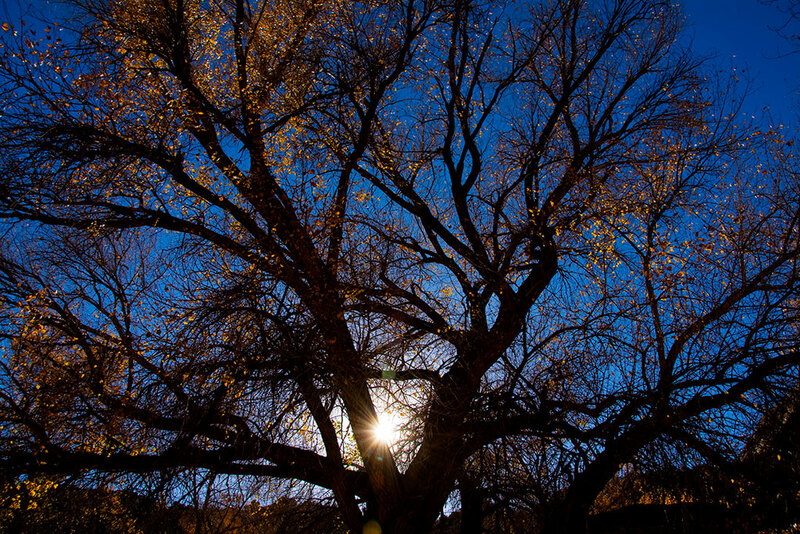 Brilliant late afternoon sun shines through cottonwood trees along Utah’s Indian Creek. The beautiful colors and tonal qualities were captured and preserved using the RAW file format. 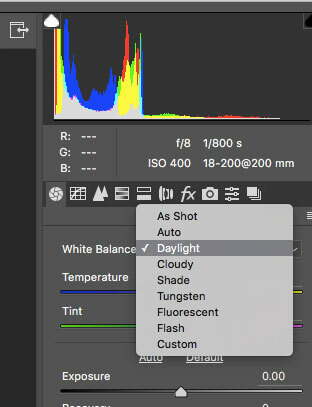 Many different software programs, like Adobe Photoshop in this screen shot, allow you to select the white balance of a RAW file after you have shot it. The day your camera was born, it was set to make JPEG files. When you pulled it out of that good-new-smelling Styrofoam clamshell and charged up the battery and were ready to shoot, you were shooting JPEGs. There’s nothing wrong with that. JPEG is robust and easy to use. Almost all of the images you see on the web, and every image you see here richardbarron.net, is a JPEG file. When I first tell my students about raw files, I explain to them that while you might like the results of shooting JPEG files, those files are married to your camera settings. If you have your camera set to “vivid” color, for example, you are stuck with a vividly-colored image. The same goes for white balance – you are mostly stuck with the white balance you set in your camera – except that you can get white balance very wrong when you are shooting. RAW files are a great way to avoid this marriage of settings. Although your RAW file might be tagged as vivid color or tungsten white balance, you can change those values as soon as you open the image. Why is this? The biggest reason is that JPEG files contain 8 bits per channel, meaning they contain 256 brightness levels per color: red, green and blue. RAW files record 12 bits of data, creating and storing 4,096 brightness levels per color, or 14 bits, creating 16,384 different brightness levels per color. Add to this the fact that we paid for all those colors when we bought our cameras, and then throw most of them away when we make JPEGs, RAW files make even more sense. 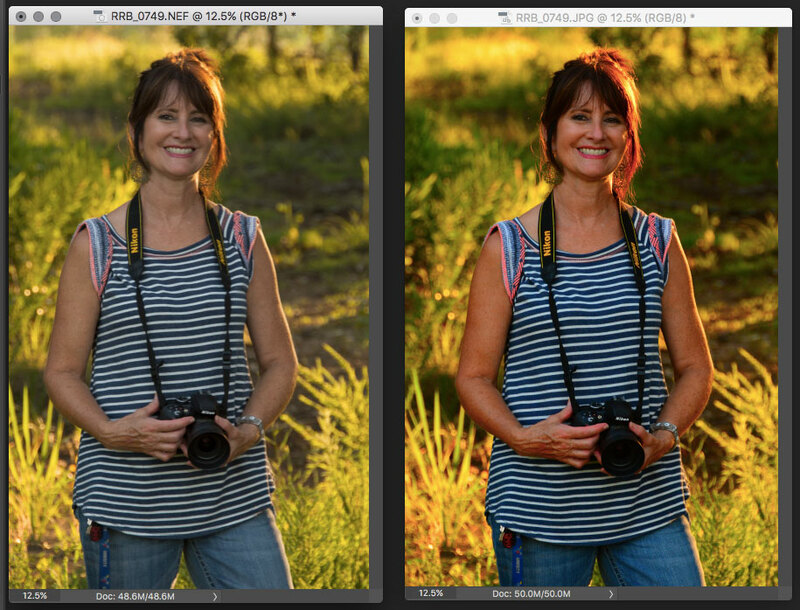 On the left is the unedited RAW file. On the right is the JPEG. Initially, it’s easy to get carried away with JPEG settings that make an image stand out. But there’s a lot more to shooting RAW than first impressions. My students and I were shooting recently on the bridge over the pond at the Pontotoc Technology Center, and ran across some beautiful light. We took turns posing for each other, and the JPEGs looked great right out of the camera. In fact, since I had my settings on vivid, the images popped beautifully, and really made a great first impression. I shoot in many circumstances that require settling for incorrect or ugly white balance, under or over exposures, and challenging lighting scenarios (like sports and spot news), and I am always glad when I can fine tune everything back at the office. 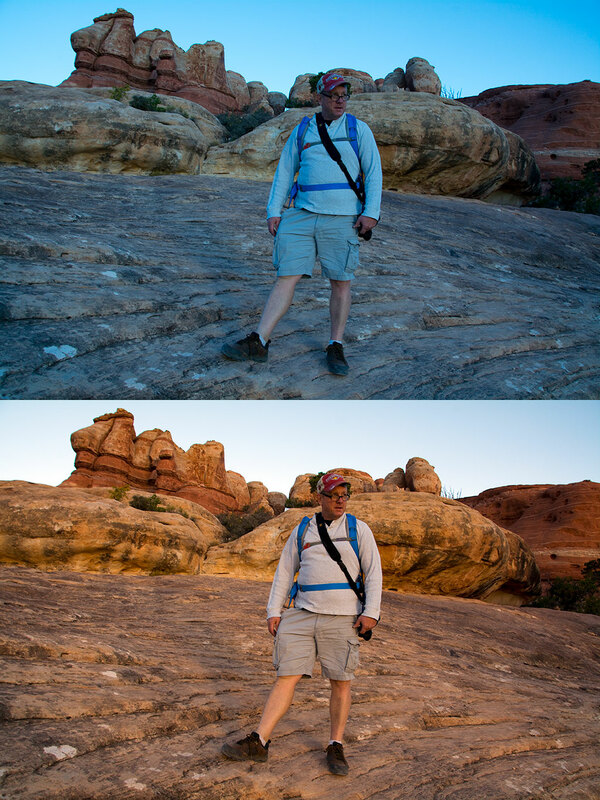 The top image came right of the camera, shot in rapidly changing conditions (sunrise in the Utah desert); the bottom image was “fixed” using Adobe’s camera raw dialog, with just a click or two. If the image was a JPEG, I would have considerable difficulty dialing out all those blue/cyan hues. I can’t begin to count the occasions when having a RAW file saved an image. I tell my students to start by setting their cameras to shoot both JPEG and RAW files, but as the years go by, I have less and less use for that tagalong JPEG.